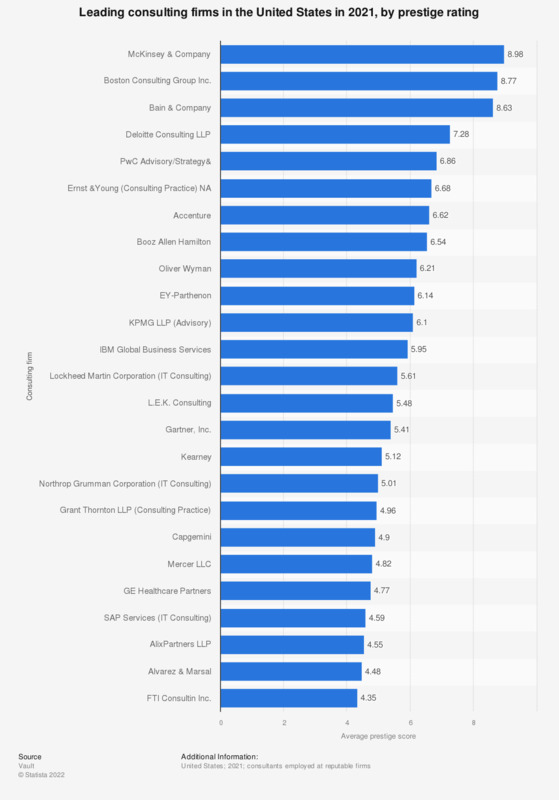 When it comes to consulting services, size does not necessarily amount to prestige; in 2018, McKinsey & Company were rated by their peers as the most prestigious consulting firm in the United States with a 9.02 rating. Of all the consultancy firms, the best known are the Big Four, accounting for almost 40 percent of the global market - Deloitte, PwC (Pricewaterhouse Coopers) , EY ( Ernst & Young) and KPMG. All four primarily provide financial consulting services such as taxation, audit, and risk advisory. Together they dominate the financial segment of the U.S. consultancy market. While the global accounting firms may have the biggest, financial advisory services is only one segment of the global consulting services market. Management consulting services, broadly conceived of as including the operations, strategy, and human resources segments, constitute over half of the global market. The remainder of the market is comprised of various IT-related services. The source does not specify the type of survey or number of respondents. For prestige ratings, respondents were only allowed to rate competitors. Respondents were asked to rate firms based on prestige on a scale of one to ten, with ten being the most prestigious.